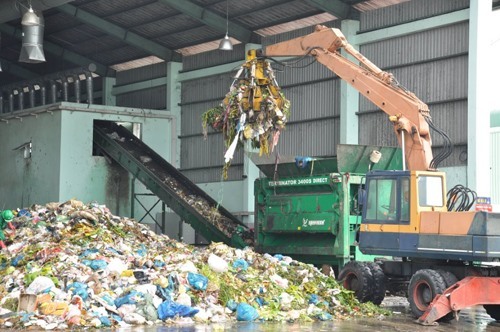 Authorities in the southern province of Cà Mau do not agree that Cà Mau City’s garbage treatment plant should extend its shutdown to conduct repairs. The company will be liable for treatment delays that have led to serious environmental pollution in the area. He said the provincial authorities understood the difficulties for the plant’s investor, Công Lý Tourism, Construction and Trading Ltd. Co, but asked the company to urgently carry out maintenance to bring the plant back into operation as soon as possible. The company has said the delay is because of a huge loss of VNĐ133 billion. The company had previously proposed increasing assistance money from the provincial budget for garbage treatment from VNĐ 350,000 per tonne VNĐ500,000, said deputy chairman Lâm Văn Bi. "The current fee is not lower than in other provinces," he said. In addition, the provincial budget was limited so it was impossible to increase assistance to the level requested by the company. The provincial People’s Committee assigned relevant agencies to help the company overcome its difficulties and create favourable conditions for the company to consume garbage post-processing products such as organic fertiliser. On July, the People’s Committee accepted Công Lý Company’s request to shut down operations for three months from July 27th to October 2nd to repair equipment that was damaged. However, after the maintenance term expired, the company requested the provincial authorities to consider extending the plant’s shutdown for another three months. The provincial People’s Committee did not accept. A representative of the company explained that the plant still lacked some imported equipment. As a result, the company requested an extension of 90 days to complete the maintenance work. Over the past three months, when the plant stopped receiving garbage, many localities have accumulated a large amount of waste, causing serious land, water and air pollution, especially in the urban areas of Sông Đốc (Trần Văn Thời District) and Cái Đôi Vàm (Phú Tân District).